Forensic Risk Alliance won GIR’s Investigations Consultancy of the Year award in 2016 and 2017 – and for good reason. The firm is a consulting powerhouse that has been instructed on some of the most high-profile investigations of recent times, including on bribery probes into Rolls-Royce and Telia. 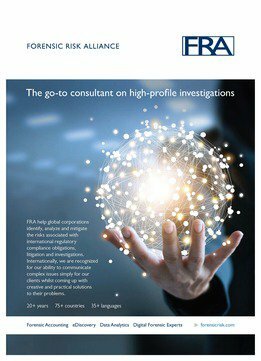 Since it was founded almost two decades ago, FRA has been a top-choice for major law firms and companies to advise on high-profile corruption, sanctions and bribery matters, providing forensic accounting and e-discovery expertise. The firm has led prominent investigations since its early days, when it helped Holocaust victims and their heirs retrieve assets stolen by Nazis prior to and during the Second World War. FRA was founded by former investment bankers Frances McLeod and Toby Duthie, and forensic accountant Greg Mason. McLeod is a GIR Women in Investigations nominee and was the lead partner in FRA’s UN oil-for-food programme investigation into allegedly corrupt payments made under the programme. The final report, presented to six US congressional committees by McLeod, revealed evidence that companies and individuals paid kickbacks to Iraqi officials to participate in the programme. Duthie is head of FRA’s London office. He has developed expertise in Foreign Corrupt Practices act matters having worked on four of the 10 largest FCPA settlements and a handful of monitorships. In FRA’s Providence office, Mason is credited with developing the company’s e-discovery tool, which allows companies to remotely process documents in compliance with data privacy, state secrecy and bank secrecy laws in multiple jurisdictions including the EU, China and Brazil. In Washington, DC Stacy Fresch is head of operations and has been appointed as an independent co-monitor in connection with a Public Company Accounting Oversight Board enforcement action. Fresch was formerly assistant chief accountant at the US Securities and Exchange Commission. Jen Baskin, a GIR Women in Investigations nominee, was the first forensic accountant assigned to the SEC’s FCPA unit in 2011, and in 2014 she was an in-house forensic accounting specialist and compliance officer at IBM. She joined the firm in 2017 from EY. In its London office, FRA hired former barrister Simon Taylor in 2017 to provide a lawyer’s perspective. Also in London, partner Emma Hodges was featured in GIR’s 40 under 40 for 2017. Recent additions to the firm include Trevor Wiles, Drew Costello and Jenna Voss. Wiles joined FRA as a partner in the firm’s forensic services practice in June after two decades at KPMG, and Voss joined as a director in New York after three years at AlixPartners. In May, Costello joined FRA after three years at Israeli drug maker Teva Pharmaceutical, where he was a director in charge of the global compliance audit team. Costello helped the company remediate after its $519 million settlement with US authorities in 2016 to resolve bribery allegations in Russia, Ukraine and Mexico. FRA was hired to assist Teva in calculating the profits earned on these sales. FRA was instructed by Rolls-Royce to analyse financial material and prepare submissions on gross profit figures for the SFO’s fraud investigation into the engineering company. Rolls-Royce paid £671 million to the DOJ and the SFO as part of a deferred prosecution agreement to settle allegations that it bribed agents to win export contracts. FRA was instructed by law firms to provide e-discovery and forensic accounting services in the corruption investigation into Swedish telecommunications company Telia. The investigation led to a first-of-its-kind settlement in 2017 with US, Dutch and Swedish authorities to resolve allegations of bribery in Uzbekistan. FRA assisted in the disgorgement negotiations. FRA has seven offices: London; Washington, DC; Providence; Paris; Zurich; Dallas; and Montreal. The number of FRA employees has increased by almost 50% since last year. FRA’s list of clients include French engineering company Technip, US oil and gas services company Weatherford International, oil company Total, and the City of Ferguson, Missouri. FRA has acted for French construction company Alstom and chemicals company Innospec. FRA was also hired by French engineering company Technip in 2008, in a DOJ investigation for alleged bribery relating to the construction of liquefied natural gas facilities in Nigeria. FRA was hired to consider the profitability of the contracts potentially tainted by bribery. In 2010, Technip paid a $240 million criminal penalty to resolve DOJ charges over the matter. In 2016, FRA was retained to support the independent monitor overseeing a settlement between the Justice Department and the Ferguson City Council. FRA is helping the monitor oversee reforms in Ferguson after the DOJ uncovered a pattern of unlawful conduct by the city’s law enforcement which disproportionately affected African Americans. FRA was also hired by the legal team of Frederic Bourke, the co-founder of luxury handbag manufacturer, Dooney & Bourke, in an FCPA investigation. Bourke was convicted of bribery in 2009 for investing $8 million in a corrupt deal to seize control of Azerbaijan’s state-oil company SOCAR. FRA was hired by Miller & Chevalier to support an independent examiner of several Swiss banks under the DOJ’s 2013 tax programme. Under the programme, Swiss banks seeking to resolve tax-related offences with the DOJ appointed an independent examiner to ensure each bank’s submission to the DOJ was accurate and timely. FRA provided the examiner with forensic accounting and data analytics expertise. Forensic Risk Alliance (FRA) is an international consultancy which works with global corporations and their counsel to identify, analyse and mitigate the risks associated with transactional compliance obligations, litigation and investigations. We are regularly hired by law firms and corporations to provide expertise on some of the world’s largest compliance matters and are consistently recommended for our ability to go the extra mile during high-stake investigations. With nearly 20 years’ of experience helping global corporations identify, analyse and mitigate the risks associated with international regulatory compliance obligations, litigation and investigations, we have built a well established reputation as trusted advisors. We deliver best-in-class services and tailored solutions for complex and highly sensitive matters, including the innovative use of data management and analytics to effectively address the needs of our clients. We are known for delivering bespoke solutions around the world for complex and highly sensitive matters and are experts in analysing large, complex transactional data sets, with experience working on projects encompassing decades of data and transactions. Our diverse team of experts are highly skilled financial, technological and governance specialists who have first-hand experience in multi-jurisdictional investigations and enforcement matters. We deploy our multi-competency teams globally to work with counsel, corporations and government authorities to develop and execute our services and solutions. We speak over 40 languages; have lived and worked in over 75 countries; and have first-hand experience with the particular challenges faced by companies operating in emerging markets. Our experts are particularly noted for their experience handling of the most sensitive cross-border investigations. In an investigation where the data cannot be moved out of the host country we use our Mobile Solution. We also offer jurisdiction-specific consulting services re data protection, blocking statutes, state secrecy, cyber laws. Our Mobile Solution handles the whole EDRM Cycle – collection, process, filtering, review and production – and can be installed quickly, anywhere in the world. It can be integrated into a client’s infrastructure or we can host at a location determined by the client, providing options for accessibility (air-gapped, restricted, or remote) rendering access from an external network impossible, ensuring cyber risk is mitigated. We have state of the art data centers around the world that meet or exceed Tier II and Tier III standards. Our security is of the highest level to protect the assets of our clients and our own organisation. We maintain an advanced, multi-layered security programme, which includes continuous monitoring, annual third-party penetration testing and vulnerability scans as well as maintaining industry security certifications. Unlike traditional accounting firms we do not perform audit or other consulting work, so we typically have no internal conflicts.